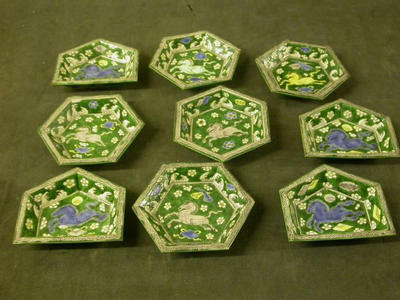 Hexagonal shaped porcelain dish, part of a supper set (one of a set of nine comprising 38.500 to 38.508). Made in China, reign of Kangxi. John Sparks Ltd., dealer; from whom purchased by Sir William Burrell, 28 November 1933, �82 (9 dishes, 38_500-508); by whom gifted to the Corporation of the City of Glasgow, 1944. John Sparks Ltd., Day Book 1933 p.281, 23 November 1933, stock no.z.1001: '5 sweetmeat trays, green ground & horses', & '4 ditto'. Sir William Burrell, Purchase Book 1933, p.82: �5 very fine old Chinese green ground sweetmeat trays with blue, yellow and aubergine horses with wood stands. Kanghsi period 1662-1722. Also 4 ditto smaller�. Sold by John Sparks Ltd 1933.